Two plays at the end of the game that illustrate how fragile, fluid, and frankly ridiculous all this clutch/not-clutch, real human being/real hero stuff is. Sometimes you kiss it high off the backboard and it goes in. Sometimes. Sometimes it’s like what Kevin Durant said after the game: “I just missed the shot, man.” Does it matter that LeBron James was lukewarm to tepid for most of the fourth quarter (1-for-4 from the field, but a perfect 4-for-4 from the line)? 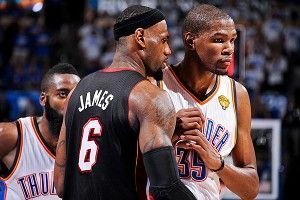 Or that Durant was a plastic explosive (16 points. SIXTEEN)? No, of course it doesn’t. In these games, it seems like you play 47 minutes to build or destroy who you are in the last 60 seconds. As always, your favorite looped images are GIFed and chopped by @Jose3030. Spotted by Rafe Bartholomew. 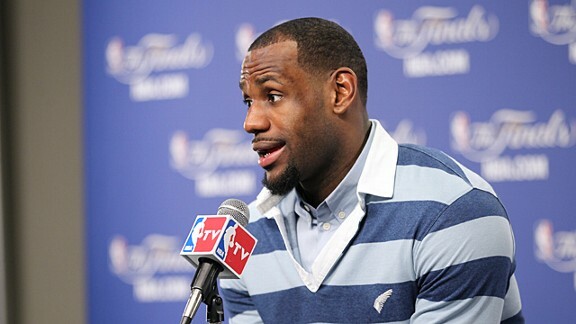 Damn, ’Bron. Thursday night’s game was riveting. It was also a complete mess. Though both teams only combined for 23 turnovers and 43 personal fouls — hardly exorbitant numbers — there was a disturbance in the force, an uneasiness in the flow. Balls were ripped and stripped; shots were pinned to the glass; rebounds were tipped out deep into the backcourt, leaving players scrambling and flailing. There was a heretofore-unseen double-flop. A tippy-toes charge. A flubbed dunk. Worst of all? A banked-in 3 from the top of the key. 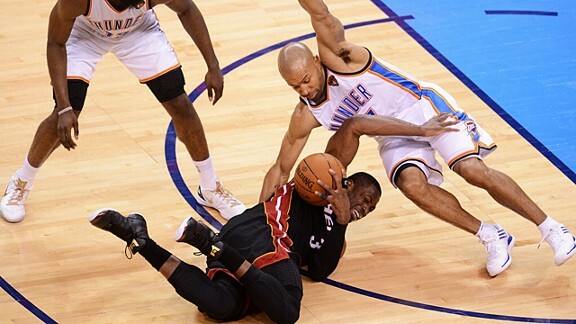 For all of the Heat’s first-quarter flambéing and the Thunder’s thrilling late-game surging, this game was ur-gly. The officials were roasted after the game for a crucial no-call on LeBron James as he contested Kevin Durant’s potentially game-tying jumper. But it was the loose-ball fouls, the reach-ins, and the initiated-contact calls that changed everything. When Durant picked up his fifth foul with more than 10 minutes left in the fourth quarter, the Thunder essentially lost an (admittedly struggling) on-ball defender, softening their ability to body-block LeBron’s bull charge. (Oklahoma City coach Scott Brooks kept his man out there, which turned out to be the right call.) With three minutes left in the quarter, LeBron dropped his head and began one of those “I will stomp on your esophagus if you don’t olé out the way” drives. Durant stepped in the lane, then quickly swiveled away, fearing contact. That’s not fun to watch. But then, these are the troubles of ticky-tack. This play made everyone look like they were on bath salts for a second. But out of the chaos! Harden! Side note: We talk a lot about Westbrook’s strength. But I don’t know if I’ve ever seen him act stronger than when he quite clearly uses his entire being to resist taking that top-of-the-key 3. 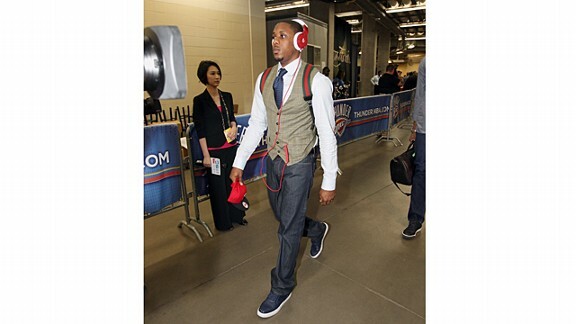 This is Mario Chalmers arriving at Game 2 of the NBA Finals. Note all his friends with him. I can only assume that right after this picture was taken Chalmers went up to Dwyane Wade and said, “Yo, man, I know you’re three episodes in to Season 1, but guess who dies on Game of Thrones! No, don’t guess! I’ll just tell you!” Then he proceeded to walk up to LeBron James and inform him that the donation LeBron made to the Mario Chalmers Foundation for Kids Who Need a Foundation was actually a rather sizable investment in Curt Schilling’s video game company. But at least they can play Kingdoms of Amalur: Reckoning together now, right? Our own Sebastian Pruiti pointed out Chalmers’s ability to take a licking and keep on ticking as an admirable quality. But personally, I’m starting to wonder if this dude is hearing impaired. The Thunder had grown up. That was the line after OKC rattled off four straight wins against San Antonio, most likely because it was an easy explanation as everyone was left shocked and looking for one. In some ways, it seemed like the Thunder’s stars did figure themselves out a bit as they clawed out of that 2-0 hole. Serge Ibaka settled into his game offensively. Kevin Durant tapped into just how unstoppable he can be. Russell Westbrook elevated the other parts of his game when the shot wasn’t falling. The problem is it was never about one step, one flip of the switch. Whatever happened against the Spurs was one more move in the right direction, and in Game 2 of the Finals, Westbrook showed where one of his next ones might have to come. 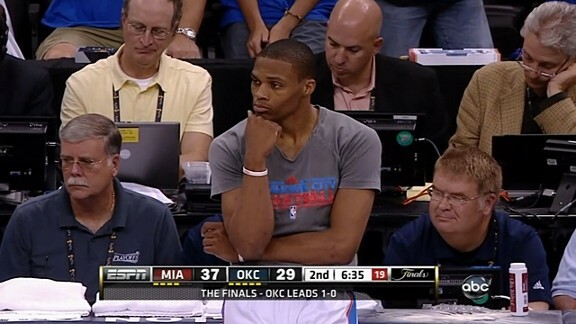 As it does, Westbrook’s jump shot failed at times Thursday night. He missed his only two pull-ups of a rough first quarter, and at one point was 2-for-10. By game’s end, Westbrook had 27 points — the problem being that they came by way of 26 shots. What Westbrook can do with his pull-up game is something no one else in the league can manage, but in the end, those 15-footers are always going to come with a hit-and-miss sort of efficiency. The takeaway from Game 2 is that when points are a struggle, Westbrook has tools to manufacture them that just about every other point guard in the league would kill for. The game that comes to mind is Game 7 of the 1998 Eastern Conference finals. In a game that felt more like a battle royale, Michael Jordan went a paltry 9-for-25 from the field. The thing is, he still managed to grind his way to 28 points and an 88-83 Bulls win, and that happened because Michael put his head down and got to the line 15 times. It was the second time in the series he’d topped 15 attempts, and over the course of seven games that could have easily gone Indiana’s way, each trip mattered. The suggestion isn’t that Westbrook lean on double-digit free throw numbers as his surest source of offense. The suggestion is that with Westbrook, milking points from the line is the worst-case scenario. Dwyane Wade is and always has been an excellent defender, but what Westbrook showed in Thursday night’s fourth quarter is that when he wants to get to the rim, he will. Derrick Rose and Tony Parker are the only two players in the NBA who can even approach how instantly Westbrook can get to the basket. The question then is why it took so long. With his ability to finish, Westbrook’s points should come inside-out rather than the other way around, and likely, the worst possible outcome will be a trip to the line. The first step was in Westbrook realizing how he could contribute without scoring. The next will be in realizing how he can score no matter what.